„Andante“ holiday guest house awaits you in peaceful area of the city, about 1 km from the center of the city Druskininkai , about 200meters from Nemunas River, about 400 m . to local lake with beach. Amazing nature of Druskininkai : pine forests, the Sun trail, Water Park, historic K.Dineikos fitness park is a real refreshment for each visitor. All rooms have shower, satellite TV and wi-fi. 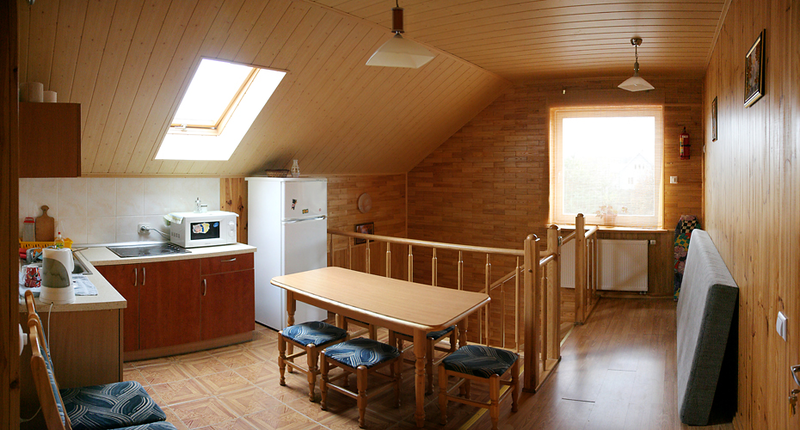 Spacious kitchen with utensils, cutlery, a refrigerator, dishwasher, washing machine, electric stoves, microwaves, kettles. We offer to play table tennis, pool, basketball. To protect from wind of warm sun, for your convenience we have three arbors. In side of courtyard we have fireplace, where you can have a barbeque and grill or just relax by the fire. Parents with small children can enjoy private, closed yard. Heated showers and kitchen floors give you the house comfort even on cooler days. Sauna – for cooler evenings. Pleasant and comfortable holidays are guaranteed not only by Andante‘s rest house quiet natural environment, but also by our collective‘s long-term experience and focus on customer quality.